Last week I posted this photo on facebook. It’s not even a good picture, but I’ve had numerous people ask for the recipes. Soooo…you can find the lemonade cake(right) recipe here. Possibly the best cake ever. 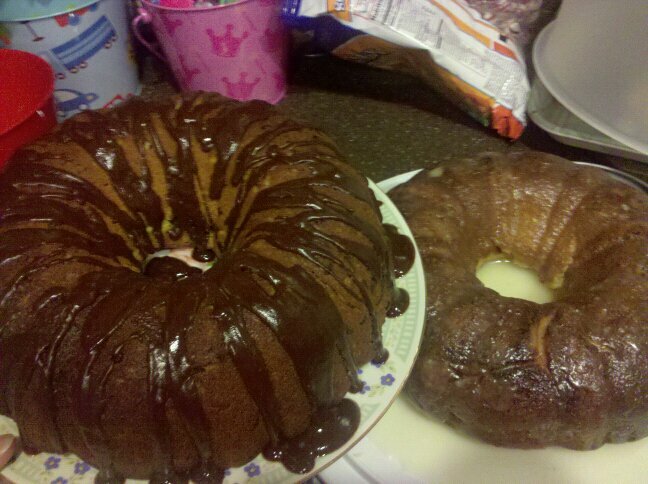 This one comes in a close second: chocolate chip pound cake. nom. Combine first five ingredients. Add chocolates and mix well. Bake at 350 for 45-55 minutes in a greased bundt pan. Melt the ingredients together over low heat or in the microwave, stirring often. Add extra corn syrup if needed to make a smooth, shiny glaze. Yield: about ½ cup glaze. Yum. I am totally moving in with you!